Marriage is stressful. I don’t take it for granted that Dave and I have made it eight years together when it seems like so many couples are getting divorced. 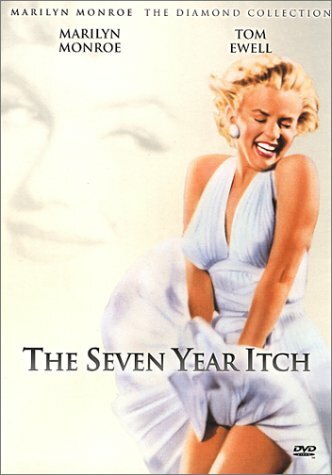 I’ve often thought about the phrase “the seven year itch” made famous by the marilyn monroe movie. who could forget that dress! When you’re married, you do get itchy. You get irritated by the sounds your spouse makes when they blow their nose or chew their food, you see them when they’re sick and pathetic and super annoying. You prickle when they do something that you think is incredibly stupid but they for some reason think is a good idea. You wonder what life would be like with someone else, if you made the right choice in marrying your spouse, and whether someone else would be a better fit. 1. He makes me laugh. every. day. Of all the people I’ve ever known Dave can make a witty comment that just cracks me up when I don’t expect it. And we can just be silly together. 2. He is a deep thinker. One minute we can be talking about which muppet we most emulate and then the next minute we’re talking about how prayer works, or environmental conservation theory. 4. He prays like he means it. Dave often reminds me that we really can trust Jesus, pray big prayers and live life as the adventure it’s meant to be. Why? Because God has our backs. Dave helps me to live into that reality when we take walks together, talk about what’s rattling around in our heads and pray about it together. 5. He loves surprises and plans for special things in our lives. For valentines day once he surprised me with a trip to a Chicago bed & breakfast, once he made a special playlist for a date, another time I came home & our whole lawn was torn out because he had got a deal on some sod & knows I love the look of a green, well kept lawn (I am my fathers daughter!) There are other times that he simply tell me that I look beautiful, that I said something that encouraged him or made him laugh. I’ve loved the big and small surprises. 6. He is the most resourceful man I know. He’s learned how to fix our cars mufflers by reading the sears auto mechanic handbook. He takes scrap wood and turns it into furniture or fixes our house. He regularly finds designer jeans (for himself) at goodwill. When he was staying home with Reuben he found a dad’s group to hang out with so he didn’t have to be home alone with a baby. The man can find a deal no matter what, help us to live on budget & still feel like we’re in the lap of luxury. He uses his creativity and resourcefulness to care for our home, family & do his job in a way that I don’t think anyone else could. 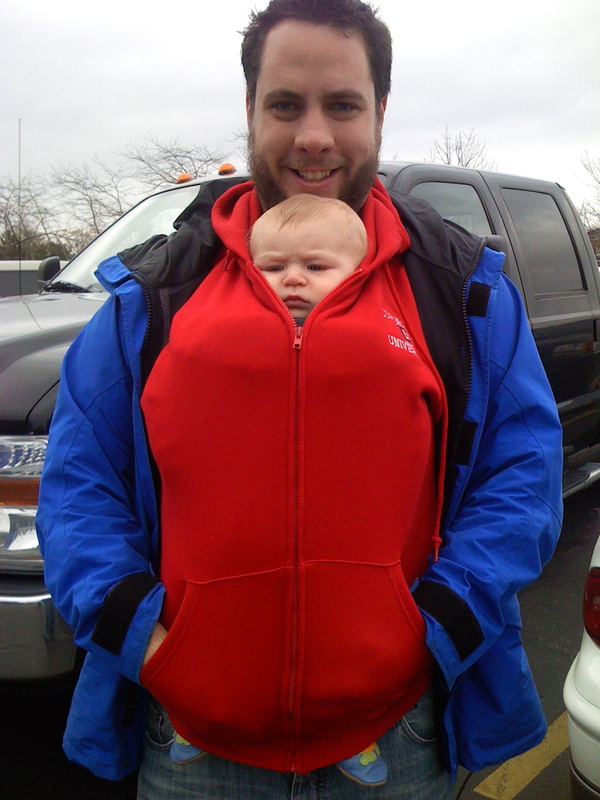 here's one way to keep a kid warm! 7. He rocks his own style. The first day I met Dave he pulled up his shirt to reveal a strip of his hairy gut, pointed to it and said “the ladies love the strip of seduction, you know you love it too” I was simultaneously disgusted, amused and impressed that he was so comfortable with his body that he could make fun of himself while flirting with me. He finds cool vintage shirts that make his blue eyes sparkle, has changed his hairstyle more times than I could count and isn’t afraid to walk on (the fashion) wild side. It has been a rare moment in our marriage where I’ve uttered the phrase “you’re wearing THAT?” And when I have it’s usually with delight at the cool outfit he’s picked out. So, happy anniversary to my wonderful hubby! I’m glad to be with you no matter what we’re doing or where we’re at. 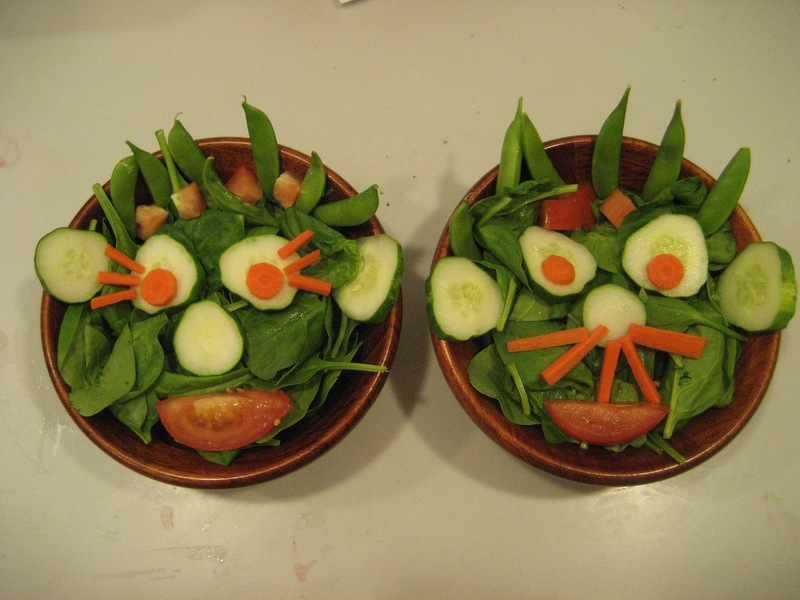 like tuna fish and cigarettes! Thanks for this post. It is such fun to read and inspiring too. I’m so very glad you love and appreciate Dave so much. You both are treasures! wonderful to read! what a precious testament of God’s faithfulness in our fidelity. I CANNOT stop laughing! It makes me miss you a ton. You guys are such a great pair. Marriage is so tough and stressful at times, especially when you are making a big move. It’s great to have these times to step back, see how God blessed us with our spouses and all the ways they make life better. You’ve inspired me, girlfriend, to make my own list for Doug.